Oven won’t get hot? Gas stove won’t ignite? Are the temperatures off in your oven? Do you have a burner out on your electric cooktop? Are all of your gas cooktop burners working? Does your oven burn food? Is your clock touch pad dark or unreadable? Do you need to have your bake or broil element replaced? Does your oven no longer self clean? Today's ovens, stoves, and ranges are electric, gas or both. Just a few of the brands we service: Maytag, Kenmore, Whirlpool, Sears, GE, Kitchen Aid, Jenn-Air, LG, Amana, Samsung, Frigidaire, Magic Chef, Hotpoint, Admiral, Whirlpool & more. And regardless of where you bought your appliance we are here to serve you! Oven, stove and range repair is as simple as contacting Goodmans Appliance Repair!. 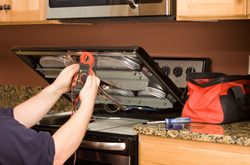 We have a vast array of knowledge and experience to get your appliance back in service quickly. Baking, broiling, simmering, and stirring, the oven is the heart of the kitchen. Our affordable service can bring your kitchen back to life faster than you can order take-out. Call or Text us today at 303-828-6111 and we'll be on our way!